Arthur William Jackson was born in Beeston in 18902, the elder son, third child of Arthur and Emma (née Pike, formerly Keywood3) Jackson. Arthur senior had come to Beeston with his parents, as a child, from Smalley, Derbyshire where he was born. He had worked in various jobs but mainly as a gardener, as was the situation when he and Emma set up home together in about 1885. By 1891, they were living in Crown Yard, Beeston, with three children, including Arthur William, aged 8 months4. They married in 18945 and, by 1901, Arthur senior was working as a labourer at the Humber cycle works in Beeston and living with his family at Brown Lane South, Beeston6. In 1910, Arthur William, by then working as a foundry labourer, married Jennie Elizabeth Wheelhouse7 and they set up home at 4 Alexander Cottages, Villa Street, Beeston8, where their son, also named Arthur William, was born later that year. Miriam, their daughter, was born towards the end of 19119. Although his Army Service Record has not survived, it appears that Arthur enlisted in January 1915, with The Notts & Derby Regiment10 and, after a period of basic training, was transferred to the 103rd Company, Machine Gun Corps, probably in time for its deployment in the Battle of the Somme in July 1916. The Machine Gun Corps was formed in October 1915 to make more efficient use of the available Maxim guns which were then in short supply and to provide specialist skills and tactics in their use. A specialist training centre was established at Grantham, Lincolnshire and the Maxim was soon replaced by the Vickers machine gun, a heavy, water cooled, tripod-mounted gun which could fire at 500 rounds per minute. It was deployed by groups of four men needed to carry, load and fire with a further two in reserve. The Lewis gun had also been in use in some units from mid-1915. This lighter weapon needed just two men to load and fire and was capable of bursts of 700 rounds per minute. By the time the Corps was deployed in the 1916 Somme offensive, it had these new weapons to begin to match the devastating tactics using machine gun fire that were already well developed by the enemy and which would then again be deployed with terrible effect. It would take some time for fully effective tactics to be fully developed - using a creeping barrage similar to existing infantry, eventually combined with Divisional deployment - but these techniques were to play a significant part in the eventual victory11. 103rd Company had moved to joined 34th Division towards the end of April 1916, in time for the Somme Battles which included action at the Battle of Albert, the Battle of Bazentin Ridge, the Battle of Pozieres Ridge and the Battle of Flers-Courcelette, Then, in early 1917, by which time the concept of Divisional command and deployment was in place, they again saw action, this time in the Arras offensive, which included the Battles of the Scarpe12. It was on the first day of the Battle of Arleux, a follow on from the Second Battle of the Scarpe, that Private Jackson was killed in action. 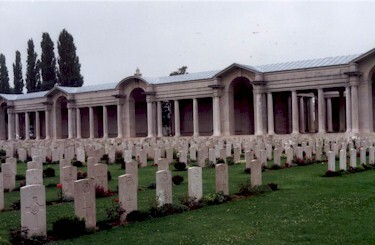 As his body was never identified, Private Jackson is remembered on the Arras Memorial, in the Faubourg-d'Amiens Cemetery, Arras, which commemorates almost 35,000 servicemen from the United Kingdom, South Africa and New Zealand who died in the Arras sector between the spring of 1916 and 7 August 1918, and have no known grave13. He was posthumously awarded the Victory Medal and the British Medal14. Arthur's Army financial effects of £6 6s were paid to his widow and sole legatee on 17 January 1918 and she received his War Gratuity of £10 on 20 October 191915. By this time, she had moved, with her children, to 5 Kingston Terrace, Beaumont Street, Sneinton Road, Nottingham16. She died in 1971. 2His birth was registered in Basford Registration District (of which Beeston was part) in Q2/1890 (Ref 7b 181). He was baptised at Beeston Parish Church on 10 September 1890. 3Emma Pike had married Richard Keywood in Wilford, Notts on 24 December 1882 but, by 1886, she had started a relationship with Arthur Jackson. Their first child was registered in Basford Registration District, in Q1/1887 (7b 167), as Henrietta Jackson Keywood, followed by Emily Hannah in 1888, Arthur William in 1890, Levi in 1895, Annie in 1897, Elizabeth in c1900, George in 1901, Bertie in 1904 and Alfred in 1906. 41891 Census, Piece 2671 Folio 35. 5Their marriage was registered in Basford Registration District (of which Beeston was part) in Q2/1894 (Ref 7b 321). 61901 Census, Piece 3153 Folio 152. 7Their marriage was registered in Nottingham Registration District in Q2/1910 (Ref 7b 628). 81911 Census, Piece 20426 RD429 SD3 ED1 Sched 205. 9Arthur William junior was recorded as age 6 months and born at 'Alexandra Cottages' in the census in April 1911. Miriam's birth date was recorded as 15 November 1911 when her death was registered in October 1993. 10His enlistment date was calculated based on the amount of his War Gratuity. His early service with Notts & Derby Regiment (Service number 22872) is mentioned in his entry in 'Soldiers Died in the Great War' and in the Medal Rolls. 13This description of the Arras Memorial is based on that included in the Commonwealth War Graves Commission website. 14Arthur's medal awards are recorded in the Medal Rolls, available on ancestry.com. No medal card has been found. 15Army Registers of Soldiers' Effects, 1901-1929, available on ancestry.com. 16This address is given in Private Jackson's Commonwealth War Graves record.